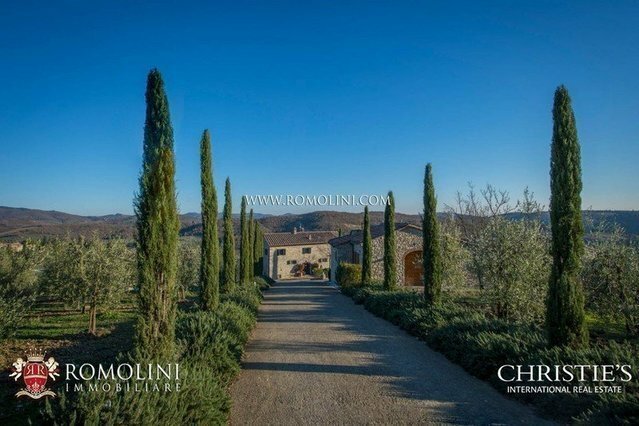 On the hills of Chianti Classico surrounding Siena, this hamlet with cellar and 12.5 ha of Chianti Classico DOCG vineyard is perfect for whoever is looking for a well-started business to complete with a B&B-like activity. The presence of 9 bedrooms and almost 1,400 sqm of total surface allow hosting numerous guests while keeping the wine production running. GEOGRAPHIC POSITION In panoramic position on the Chianti hills surrounding Siena, beautiful restored hamlet with Chianti Classico DOCG vineyards and cellar.Easily reached via municipal road network and fitted with a useful graveled apron to be used as a parking lot, the property is located not far from the most renowned and appreciated towns of Tuscany: the wine town of Greve in Chianti (18km; 30rsquo;), the medieval Siena (35km; 55rsquo;), the turreted San Gimignano (39km; 1h), the Renaissance Florence (53km; 1h 10rsquo;), Arezzo (61km; 1h 5rsquo;) and Pisa with its famous leaning tower (111km; 1h 45rsquo;).The most useful airports to reach the property are Firenze Peretola (63km; 1h), Pisa Galilei (108km; 1h 40rsquo;), Bologna Marconi (145km; 1h 50rsquo;), Ancona Falconara (235km; 2h 50rsquo;), Roma Ciampino (262km; 3h 5rsquo;) and Roma Fiumicino (276km; 3h). DESCRIPTION OF THE BUILDINGS The property is made up of four buildings, all made out of stone and perfectly restored.The building Ndeg;1 (940 sqm) is split among four floors in total and includes the cellar (basement for a total of 600 sqm ndash; 6,456 sqft) and the main residence (ground and first floor for a total of 340 sqm ndash; 3,658 sqft):- Basement: cellar with vinification and ageing locals and bathroom for the workers;- Ground floor: entrance room, small cellar for wine stocking, living room, 3 bedrooms, 2 bathrooms, kitchen and 25 sqm terrace.- First floor: open space living room with kitchen, 4 bedrooms, 2 bathrooms, sitting room and kitchen.The building Ndeg;2 is a stone farmhouse (150 sqm ndash; 1,614 sqft) on a single floor with a loft. Here we find an open space living room with kitchen, a studio, 2 bedrooms and 2 bathrooms.The building Ndeg;3 (90 sqm ndash; 968 sqft) was built in 2009 with the aim of having a bottling facility direcly in the estate. The building hosts a bathroom for the workers.The building Ndeg;4 (200 sqm ndash; 2,156 sqft) is an agricultural shed split into two locals earmarked to tools safekeeping and vehicle workshops. STATE AND FINISHES The property is prevalently made up of historical buildings attentively restored to preserve those typical traits of countryside buildings. Usual stone walls on the outside are complemented by terracotta floors and wooden beams on the inside. The cellar is ample and allows working easily with the equipment. EXTERNAL AREA The property is located at the bottom of a dead-end paved road, which grants a high degree of privacy and security. The buildings are surrounded by a graveled apron usable as a parking lot.The land of the property covers 24.4 hectares and is split so that a part is right next to the buildings and the other is a short distance away.The vineyards are the piegrave;ce de reacute;sistance of the property: with a surface of 12.5 hectares, they are scattered around the hamlet and, even if such a positioning might look puzzling at first and highly uneconomical, it grants an excellent protection against atmospheric factors such as hail, allowing the production of wine even in occasional bad years.The remaining land is covered in olive grove (5.3 ha), mixed and coppice woodland (3.6 ha), grazing land (0.7 ha) and arable land (2.3 ha). DETAILS ON WINE PRODUCTION - Vineyard surface: 12.5 hectares - Varieties: Sangiovese (90%), Merlot (8%), Colorino (1%) and Canaiolo (1%) - Altitude: 450 ndash; 550 m - Training system: pruned-spur cordon-trained vines, Guyot - Harvesting: manual - Yearly production: up to 100,000 bottles - Maximum capacity of the cellar: 2,500 hl PRODUCED WINES diams;Chianti Classico DOCG: 90% Sangiovese, 10% Merlot diams;Chianti Classico DOCG Riserva: 80% Sangiovese, 15% Merlot, 5% Colorino diams;Rosso Toscano IGT: 95% Sangiovese, 5% Colorino diams;Rosso Toscano IGT: 85% Sangiovese, 15% Merlot USO E POTENZIALITAgrave; The property is currently run a wine-producing facility, with a maximum production of 100,000 bottles of wine (among which the prestigious Chianti Classico DOCG). The presence of numerous bedrooms and the peculiar internal organization allows starting a Bamp;B-like hosting business, keeping the building Ndeg;2 for the owners and using the other for guests.